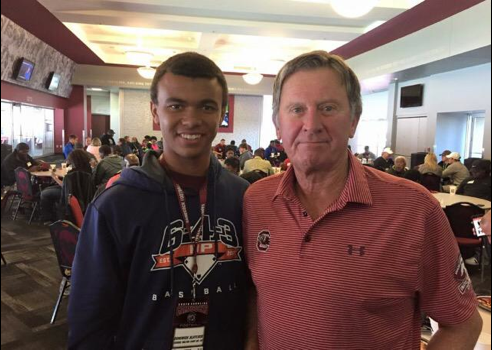 Elite Junior Classic 8th Grade All-Star Dominick Blaylock received his first scholarship offer this weekend during a visit to South Carolina. Blaylock is the younger brother of Daron and Zack Blaylock, the All-State twins that led Walton to the state finals in 2011 and now play for Kentucky. Blaylock, a sure-handed, playmaking wide receiver, starred in December’s Elite Junior Classic 8th Grade All-Star game at McEachern High School and finished with a game-high 107 yards off six receptions and was named the Offensive MVP. Blaylock is the son of former Atlanta Hawk Mookie Blaylock and is now raised by his mother Janelle Woods (an all-state selection in basketball, track and volleyball during her high school career in Fort Morgan, Colorado) and his stepfather John Woods, a former University of Tennessee at Chattanooga lineman. Woods has a strong baseball background that has helped Blaylock hone his wide range talents on the diamond and just recently purchased the Chattanooga Lookouts, a Double-A affiliate of the Minnesota Twins. Blaylock’s young baseball career has also seen him standout athletically. In 2013, he won the “fastest man” competition in Cooperstown, N.Y., after running the 70-foot bases in 12.5 seconds. He also won the competition at age 10 and is the only two-time champion. That achievement resulted in the middle schooler’s cleats now being displayed in the Cooperstown Youth Hall of Fame. That same year, Blaylock’s skills on Walton’s 7th grade football team began to show and he included a four-touchdown performance in the Raiders’ playoff win over John’s Creek. Blalock is a Class of 2019 Elite 101 member and is also a former Eastbay Youth All-American.